In a town hall meeting setting held Wednesday night at City Hall, three members of the Elk Grove City Council listened to pointed comments and discussed several topics with about 30 people in a forum called Greater Than Three. 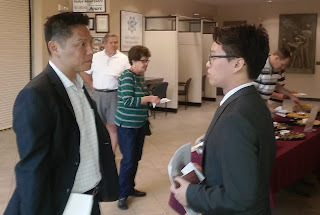 The meeting, which was organized by the Elk Grove Community Connection and Mayor Gary Davis, also included council members Steve Detrick and Darren Suen. The three council members heard a variety of topics from constituents including the city's ban on medical marijuana dispensaries, traffic in neighborhoods from schools, ride-sharing services in Elk Grove, the groundwater sustainability act, residential burglaries, road maintenance, and expansion of the city boundaries via the sphere of influence process. 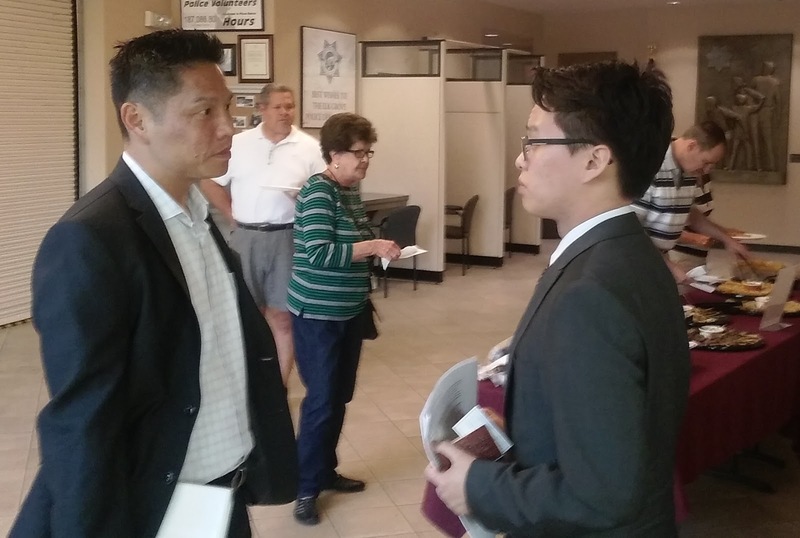 Kicking off the evening's discussion was Elk Grove resident and recent Franklin High School graduate Vincent Vo, who advocated for the repeal of the city's ordinance banning medical marijuana dispensaries. Vo explained why he felt the city should repeal the law by framing it in a detailed story of how a medical marijuana dispensary could have positively helped a family member. Vo's discussion spurred comments from fellow resident Dennis Williams, who said he opposed the establishment of these businesses in the city. Opposing Williams and speaking in support of Vo's suggestions was Gerald Cassidy, who said medical marijuana is beneficial to families in need of non-traditional medical treatments. .
"Families are flocking to Colorado for marijuana," Cassidy said referencing that state's legalization of the substance. Williams followed up Vo by discussing a lingering problem in the East Franklin area - traffic in neighborhoods stemming from the parents dropping and picking up their children from school. In spite of efforts by the city to address the situation, Williams said the problems persist and suggested the Elk Grove Police Department's volunteer program, VIPS, could help resolve things. "Please write an ordinance to allow VIPS the authority to write [parking] tickets," Williams said. Detrick acknowledged the challenges saying the matter was exasperated when the Elk Grove Unified School District discontinued bus transportation services and added "the problem is not unique to your neighborhood." One of the pointed discussions of the evening was initiated by Gerald Cassidy, who discussed ride-sharing services, Uber in particular, that operate in Elk Grove. Cassidy, who owns a countywide licensed wheelchair transportation service, joins a worldwide chorus of taxi operators critical of Uber. "There are no regulations for these people," Cassidy claimed. "It is a worldwide criminal syndication." Cassidy also passionately criticized Davis and California Assemblymember Jim Cooper (D - Elk Grove) for attending the ribbon cutting of an Uber office that recently opened in the city. Cassidy also suggested that Uber was given a special incentive to open in Elk Grove. "They weren't given any special assistance or incentive," Davis said in response. Davis did say Cassidy's suggestion to have drivers fingerprinted should be considered by the city council. Also attending the meeting was Joe Debbs, who is a Field Manager for California State Senator Richard Pan (D - Sacramento), but spoke as a private citizen. As a previous Sacramento area resident, Debbs said he was never burglarized while living in the Oak Park or Tahoe Park neighborhoods, but his Elk Grove home has been victimized three times in the 12 years he has lived in the city. Debbs acknowledged the effectiveness of the Elk Grove Police Department but said residential and business breaking and entries needs to be addressed. "This is the burglary capitol of the region, it is easy pickin'," he said. "Let's start by fighting the burglaries." Rural resident Suzanne Pecci discussed new laws regarding well water under the Ground Water Sustainability Act and wanted to know if the city was addressing the matter and what effect it might have on the city's rural residences. After a lengthy discussion regarding the nuances of the legislation, the council members said they would organize a workshop to discuss and examine the matter in greater detail. With regards to road maintenance issues, resident Sharon Lynes wanted to know what was being done by the city to bring roads up to grade and where was the money going to come from to pay for it. "The roads are getting noticeably worse," she said. "I want to know what the city is doing about this." Detrick and Suen both noted the city has a current budget shortfall on road maintenance, but added new sources of revenue may come available. Those sources could be from a possible countywide sales tax increase from the Sacramento Transportation Authority and a local sales tax increase the City of Elk Grove is considering placing on the November ballot. The final conversation of the evening was initiated by resident Lynn Wheat whose topic seemed to wrap-up several issues discussed during the evening. A longtime critic of Elk Grove's efforts to expand its boundaries, Wheat explained the various historical and current sphere of influence applications being pursued by the city and private parties. Wheat said she loves Elk Grove, especially its people, and stressed that the city should look at "putting it resources inward" to improve the quality of life and services for current residents and be less concerned about appeasing developers hoping to build more rooftops. Wheat also said several of the problems discussed, such as crumbling roads and traffic in the neighborhoods from more schools as cited by Dennis Williams, is the result of actions by the Elk Grove City Council, not the Elk Grove Unified School District as several council members have suggested in the past. "As for traffic, we are looking at the best it is going to be," Wheat noted. "It is only going to get worse." Following the adjournment of the meeting, a raffle prize drawing was held, and members of the audience and council members informally discussed the various topics covered. Also, even though they disagreed on the medical marijuana issue, Williams and Vo engaged in a conversation where Williams commended Vo for becoming involved in civic matters. "Our meeting served its purpose - open dialogue among the community and City Council," Davis said after the meeting. "I appreciate the direct feedback and walk away with greater insight into what some residents are thinking and also have some clear next steps."